Although I am long past the days of obsessing over my American Girl doll collection, I will never be too old to forget my favorite doll. 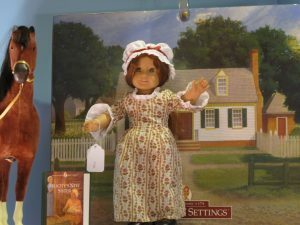 Felicity Merriman was my very first American Girl doll, and she’s held my bias ever since. 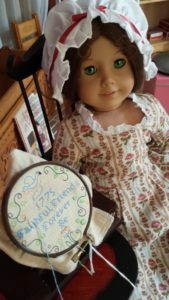 As a little girl I was first attracted to the appearance of the Felicity doll: a beautiful porcelain face surrounded by silky, auburn hair and complimented by bright green eyes. She was beautiful. Yet, as I grew older and learned the story of Felicity, I began to appreciate more than just the superficial traits of my doll. 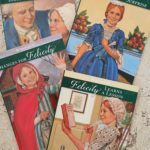 The character of Felicity Merriman is revealed through her experiences growing up in colonial America during the Revolutionary War. Her independence, loyalty, and bright spirit are what make Felicity such an admirable character that inspired me and undoubtedly other young girls who read the 6-book series about Felicity. Felicity Merriman was born on April 21, 1765, in Williamsburg, Virginia, to Martha and Edward Merriman. Felicity is the oldest of their four children. Felicity is identified as a “tomboy”, as she is very active for a girl in her time period and loves horseback riding at her grandfather’s plantation. Often times Felicity is criticized for not being more ladylike, but this does not suppress her love of the outdoors and horse Penny. However, she does enjoy playing her guitar and doing garden work, which were both considered feminine activities in the eighteenth century. 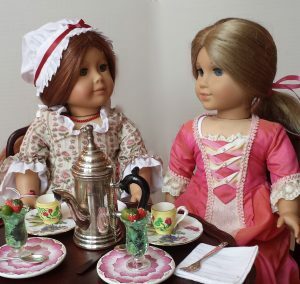 She also spends her time with her best friend Elizabeth, who is another character in the American Girl collection. Felicity’s relationship with Elizabeth reveals the contemporary challenges that Felicity faces. The Merrimans are patriots and want to win independence from Great Britain. Meanwhile, Elizabeth and her family are loyalists and disagree with the revolution. Thus, Felicity faces a dilemma between remaining loyal to her family while still maintaining her friendship with Elizabeth. Despite her challenges, Felicity never loses her sprightly attitude and continues to uphold her independent thought. These qualities are what make Felicity such a wonderful role model for young girls who learn her story. 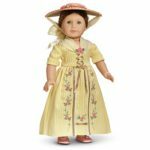 Felicity’s outfits are some of my favorites out of the entire American Girl historical collection. My absolute favorite Felicity outfit is her yellow Tea Lesson Gown. I never had this outfit when I owned my Felicity doll, but I admire it now from afar as it hangs on the clothing rack in Girl AGain. As for my favorite Felicity accessory, it would have to be her horse Penny. I didn’t have any big accessories for my dolls when I was younger, so I think I appreciate the larger-scale accessories now that I see plenty of them in the store. 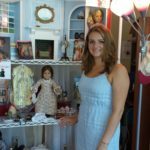 Along with clothes and outfits, each American Girl doll is accompanied by a collection of six books that narrates the story of their lives. My favorite scene of Felicity’s is from “Felicity Saves the Day” when she saves Benjamin Davidson after Benjamin is hurt while fighting for the Patriot Army. Her heroic action shows her bravery and loyalty to her friend Benjamin, which are both qualities to be admired. Felicity Merriman served as a role model for me during my childhood, and reflecting on her character and my experiences with her brings me comforting memories. Working at Girl AGain has allowed me to relive my childhood while supporting Girl AGain’s wonderful mission, which makes my summer job as incredibly enjoyable as it is rewarding. Jacqueline with a display of Felicity and her yellow tea dress. 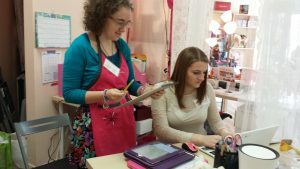 Jacqueline DiSalvatore is the summer Assistant Manager at Girl AGain. She is a rising Sophomore at Georgetown University. Jacqueline began volunteering at Girl AGain as a peer mentor in 2014 while a student at Maria Regina High School. She generously donated her American Girl collection to Girl AGain. Jacqueline is a wonderful role model for our Yes She Can trainees.